Very CLEAN (OMG!!) - Nicely Equipped with both HEATPUMP & GENERATOR PLUS MUCH MORE!!! - READY TO GO WHEREVER YOU POINT HER - A REAL MUST SEE!!!! Adagio is well equipped. All maintenance has been done on schedule and documented. Waste Tank and all Waste Hoses were replaced in 2008. “Adagio” is immaculate. The Island Packet 380, built from 2000 to 2004, replaced the 37 and is Island Packet’s largest yacht with a single head. Consequently, the 380 has plenty of elbow and storage room and an especially large galley and forward head with a luxurious shower stall. Every bit of space is utilized. She has an island berth in the forward cabin and the large, athwartship aft cabin has a clever pull out sink in lieu of a second, space gobbling head. 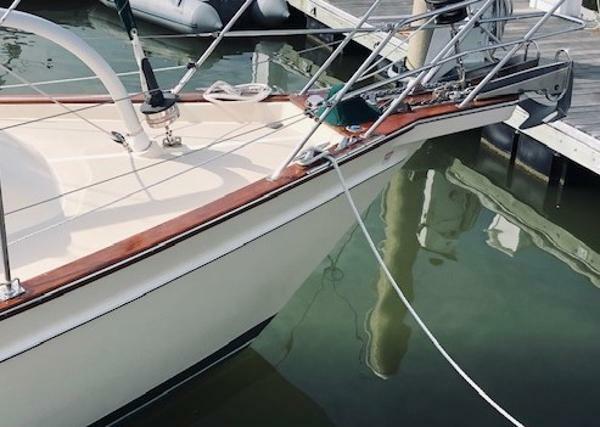 The 380 is bigger than the current 370 having a foot longer waterline, and 85 sq ft more sail area than the older 37 and 71' more than the 370. 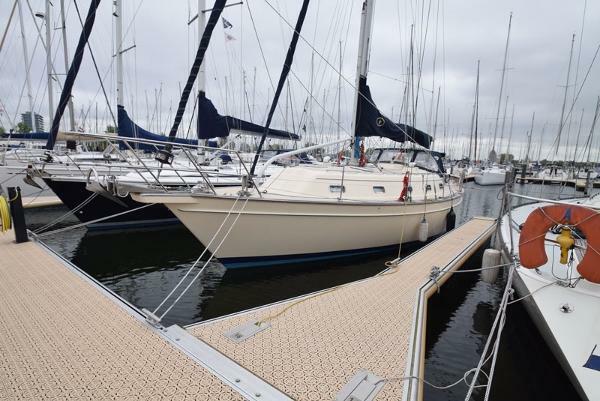 Island Packet 380Very seaworthy ship with a comfortable sea behavior. Despite its seaworthiness, it only has a draft of 1.40, making it possible for many places to be reached. The cockpit is very spacious and well sheltered. There are waterproof outdoor cushions and a wonderful place to sit while sailing are the chairs in the pushpits. The Island Packet is a wide ship which delivers a very spacious interior. High quality stainless steel has been used all over the boat. This ship is from the first owner who has sailed great trips with the ship. The ship is ready to go further with a new owner. The VAT is demonstrably paid. 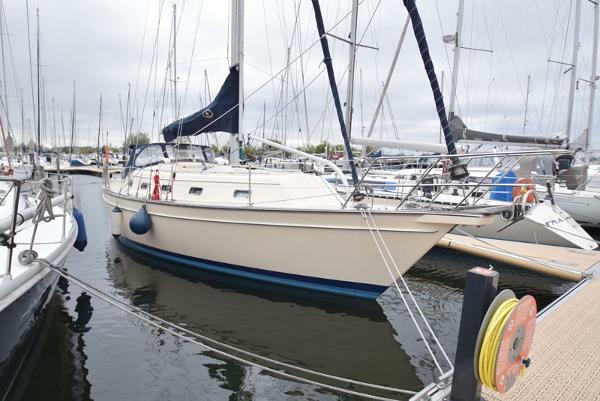 General:Name of ship Nepos, Island Packet 380, Length 12.06 m, Width 4.05 m, Draft 1.40 m, Year built 2000, Building number TDL38064L900, Builder Island Packet Yachts, Designer Bob Johnson, roundbilge, longkeel, polyester, waterdisplacement 9.500 kg, ballast 4.100 kg, steering wheel , stainless steel anchor, 40 meter stainless steel anchor chain, electric anchor winch, integrated swimming platform, stainless steel swim ladder, lifebuoy, rescue boy, hardened glass windows in stainless steel frame, interior teak, 6 sleeping places, 2 cabins, headroom salon 1.95 m, bed length forecabin 2.00 m equipped with thicker mattress, saloon bedlength starboard side 1.98m and port side 1.80m, bedlength aft cabin 2.05m cross sleeper. Engine:Engine type Yanmar 4JH3E, 56 hp, diesel, building number E21676, year of manufacture 2000, diesel, consumption approx. 3,5 liter/hour, propeller shaft, indirect cooling, 3-blade fixed screw, aluminum fuel tank 320 liter, RPM gauge, hour counter approx. 2.500 hours, signal for oil pressure and temperature, fuel level meter. 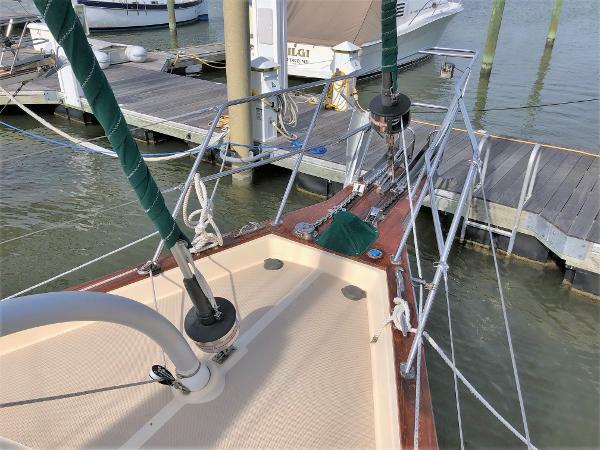 Rigging:Bridge clearance 17.00 m, toprigging, mainsail 2000 with double reef, Genua from 2000 on Harken furling system, Cutter jib from 2000 on Harken furling system and hoit boom, halfwinder with snuffer, removable backstays from Dyneema, sprayhood, bimini, 2 Lewmar winches ST48 electric , 2 Lewmar winches ST30, 1 times Lewmar winch 8. 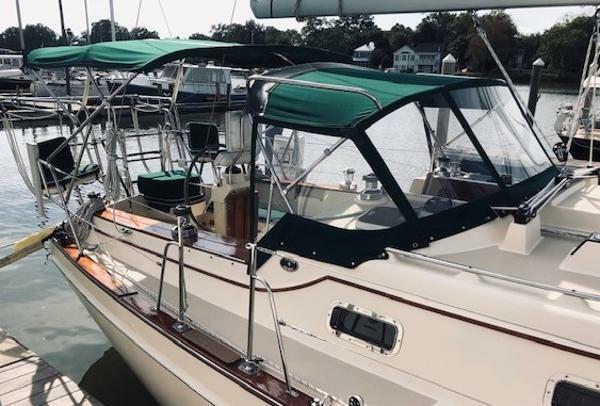 Navigation and equipment: 4 * 110 Ah batteries, 12 Volt system, shore power supply with earth leakage switch, C-Charger 5000 40 Ah battery charger, Ritchie compass on steering wheel, Raymarine ST60 Depth, Raymarine ST60 Speed, Raymarine ST60 Wind, Raymarine ST60 Multi, Raytheon RL70 radar, Raytheon ST6000+ autopilot directly connected on steering quadrant, Furuno GP-31 GPS, Shipmate VHF, outdoor speaker, Pioneer radio/CD player, Epirb (operation not known), navigation lights. Gas and water: Aluminum water tank total 640 liter, electric water pressure system, water level meter, boiler (220V + engine), shower outside wirh cold water, shower inside with hot and cold water, Jabsco underwater toilet, aluminum holding tank 150 liter and mercerator pump, refrigerator, Princess 3-burner cooker (gas), oven, Webasto heating on diesel, Origo microwave on 220V. 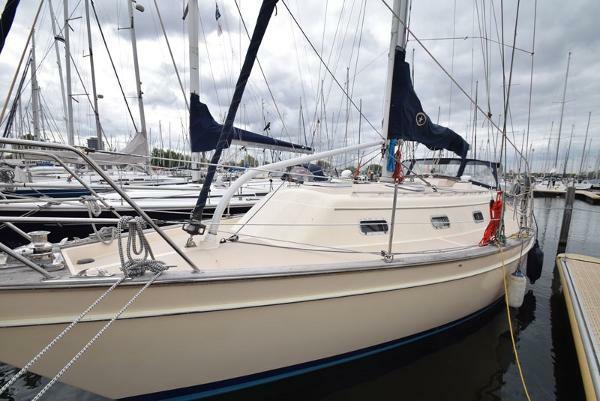 Disclaimer:All information given herin is to our best knowledge and belief, however Yachtbrokerage eSailing declines all responsibility for the quality and/or specification of the boat.